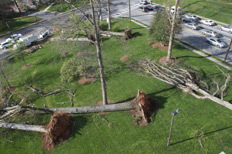 A severe storm in April ripped several trees from the lawn of the Law building, causing traffic jams and power outtages. ● Enroll and update emergency contact information in Emory's Emergency Notification Program through OPUS or PeopleSoft. ● Program the Emory Police Department number (404.727.6111) into your cell phone. ● Know more than one way to exit your building and know where to seek shelter in the event of severe weather or a tornado. A new weather monitoring system being used by Emory's Office of Critical Event Preparedness and Response (CEPAR) is making it easier to track the eye of a storm and alert the campus community to dangerous tornadoes and high-speed straight-line winds. The system, operated by private information systems provider Telvent, allows Emory to pinpoint severe weather headed for the Emory and Oxford campuses, Emory Healthcare facilities and Yerkes National Primate Research Center. Previously, the University relied on the National Weather Service, which issued countywide warnings but could not give precise geographic alerts. "Weather is predictably unpredictable," notes CEPAR senior administrator Sam Shartar, adding that a tornado warning can be issued within minutes of an actual tornado touching down. Under the new monitoring system adopted earlier this year, CEPAR, the Emory Police Department and other partners across the University community will have access to a round-the-clock staff of meteorologists who can analyze storm cells using computer modeling. After confirming a tornado warning or straight-line wind speeds of at least 70 mph near Emory-owned facilities, University administrators will activate a multi-pronged emergency notification system for students, staff, faculty and visitors. This includes: Triggering outdoor sirens and a public address system; sending text messages to participating cell phones; distributing an all-Emory email alert; and placing banner alerts on Emory web pages and Emory cable television. While Emory is not located in tornado alley, the threat is still real. A tornado caused widespread damage to downtown Atlanta in 2008. This April, another tornado tore through Tuscaloosa, Ala., killing 50 people, including six University of Alabama students. During a tornado warning, Emory community members are encouraged to take immediate action, retreating to an interior room on the lowest level of a building, away from glass and doors. Weather monitoring and alert systems have come a long way but they are not perfect, Shartar acknowledges. While CEPAR can provide resources and timely notification, the office encourages the University community to be proactive and take personal responsibility during an emergency. "Our alerts go hand in hand with individuals taking an interest in providing for their own safety," says Alex Isakov, CEPAR executive director and associate professor of emergency medicine. "Ultimately, we're working toward achieving a more disaster-resistant community," says Isakov, who has led the development of CEPAR since it was established in 2007 as a hub for Emory's emergency planning, coordinating response and corralling resources to address catastrophic events. To keep emergency planning top-of-mind, CEPAR has a new Twitter feed @Emory_CEPAR, and has updated its website, emergency.emory.edu. There, visitors will find a personal preparedness checklist and a longer "Just In Time" Emergency Guide. To coincide with National Preparedness Month and to encourage a "culture of preparedness" on campus, CEPAR is currently working with the American Red Cross campus club to raise awareness through a T-shirt drive, poster campaign and video contest. From now until November, Emory community members are invited to submit video clips and cartoons depicting what they would do in emergency situations to emoryredcrossclub@gmail.com. T-shirts with preparedness slogans will be distributed at Wonderful Wednesday events. On Saturday, Oct. 22, the student club will host a free day-long training in first aid, CPR and disaster response. "When you're prepared, you know exactly what to do in an emergency situation," says Demilade Adedinsewo, vice president of Emory's Red Cross club and a masters of public health student. "CEPAR has been really supportive of our efforts." Other student partners for preparedness and response include Emory EMS, a volunteer emergency services unit of Emory Police, and the Student Outreach and Response Team (SORT) based out of the Rollins School of Public Health.